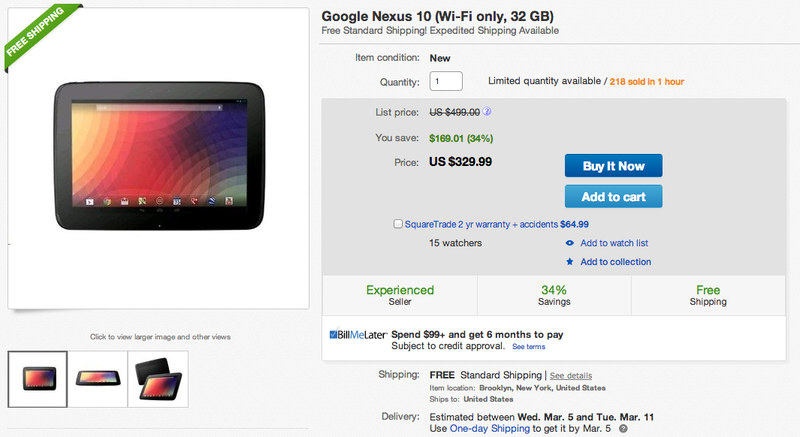 The Nexus 10, probably the tablet I have used the most over the last couple of years out of any Android tablet, can be picked up today through one of eBay’s Daily Deals for $329.99. This is the 32GB version that originally retailed for $499 at launch over a year ago and has been out of stock on Google Play for months. Other retailers are selling this model for $399 now, so at $329.99, you are still seeing a significant discount, though it’s not exactly the $170 off that the deal would lead you to believe. Either way, with its 10-inch high-res display (2560 x 1600), 2GB RAM, soft-touch finish, front-facing speakers, and newest version of Android (Kit Kat), it’s a great tablet, especially at that price. Oh, this is also a brand new unit, not refurbished or recertified or re-something’d. Free shipping is included as well.